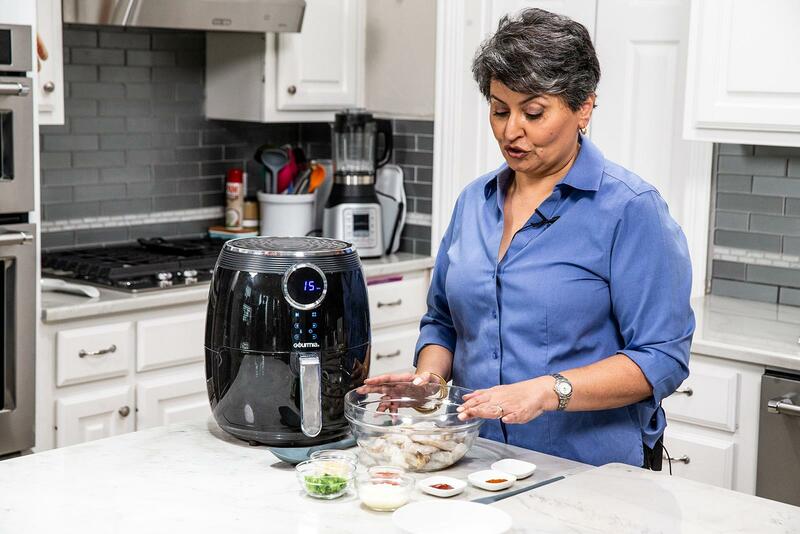 Urvashi Pitre, known as “The Butter Chicken Lady” to her thousands of social media followers, made a name for herself with Indian recipes adapted for the Instant Pot, a gadget she loves and has written multiple cookbooks about. But the self-professed gadget lover also has spent time experimenting with and testing air fryers, the hottest new kitchen appliance. She shares recipes and tips on her blog and Facebook page, facebook.com/twosleever, and now the Keller, Texas, resident has a new cookbook, “Every Day Easy Air Fryer” ($21.99, Houghton Mifflin Harcourt), which includes 100 flavorful recipes using fresh ingredients that are easy but far beyond the basics. Think veggie shoestring fries with saffron mayo, spicy Greek baked feta with honey, roasted cauliflower with tahini, miso salmon, pork bulgogi and tandoori chicken. There are even some easy desserts such as gluten-free chickpea brownies, ricotta lemon poppy seed cake and cardamom custard. Pitre also offers tips and mythbusters for the beginner (you actually need to use some oil) as well as a guide to accessories (trivets, tongs, oil spritzer). Here are a couple of recipes from the book that can be made any time. In a large glass bowl, toss the chicken, yogurt, and spices through paprika. Let stand at room temperature for 30 minutes or cover and refrigerate up to 24 hours. Place the chicken in a single layer in the air fryer basket and discard remaining marinade. Using a silicone brush, baste the chicken with vegetable oil on one side. Set the air fryer to 350 degrees for 10 minutes. Turn the chicken and baste the other side with oil. Cook for 5 minutes more. Transfer chicken to a serving platter. Sprinkle with lemon juice and toss to coat. Sprinkle with cilantro and serve. Use a vegetable peeler to lightly scrape off some of the brie rind. Place the cheese in the pan in the center of the phyllo. Spread with fig jam. Carefully fold over the phyllo one layer at a time, starting with the top layer and brushing with butter as you go. Press down so the cheese is well covered, making sure the sheets stick together. Brush with any remaining butter. Place the pan in the basket of your air fryer. Set the air fryer to 400 F for 15 minutes, checking at 10 minutes to make sure the phyllo is browning evenly. Rotate a quarter turn if not. Serve with apple and/or pear wedges.